American DJ has taken the popular Galaxian effect to a whole new dimension of excitement! The exciting Galaxian 3D features green beams that rotating back and forth creating amazing ariel effects on a ceiling or projected onto a crowd. Perfect for small clubs or the entertainer on the go! Just turn it on and let it run in sound active mode through itís exciting built-in programs. Link multiple units using 3 pin XLR Connectors to create an awesome shower of Green & Red Laser Beams creating a Solar System type effect when projected on any surface. Red and Green laser beams create exciting animated patterns on a wall or ceiling with or without the use of fog. Considering purchasing the American DJ Galaxian 3D Laser? Have questions? Ask people who've recently bought one. Do you own the American DJ Galaxian 3D Laser? Why not write a review based on your experience with it. Fantastic laser, nice combination of red and green, brilliant for small medium venues, quite bright but wish they were slightly brighter. 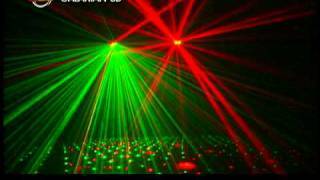 Seen a video for American DJ Galaxian 3D Laser online or have you own video? 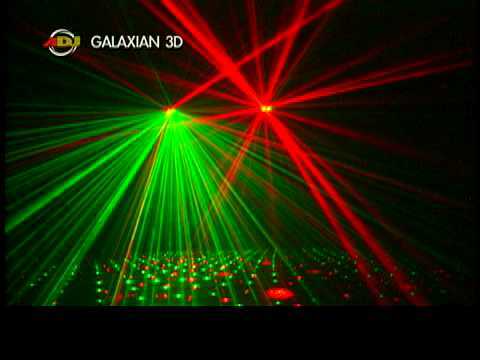 Check out American DJ Galaxian 3D Laser on DJkit.com!